Nationally, the post-Civil period was a booming time. Buffalo continued to grow, but it did not prosper as much as Rochester, Syracuse and New York City. For one thing, trains were shipping more grain than were the canals Buffalo had come to depend on. Buffalo's advantage was particularly weakened during the frozen winters, when ice blocked the canals. Nevertheless, businesses were thriving, and many of the oldest downtown houses were demolished, to make room for commercial development. Again, Buffalo lost its earliest buildings. New homes were built in Johnson Park and Allentown, for both workmen and wealthy families. Working families would later use some of these "workmen's cottages" to do piecemeal labor at home for neighborhood leather businesses. 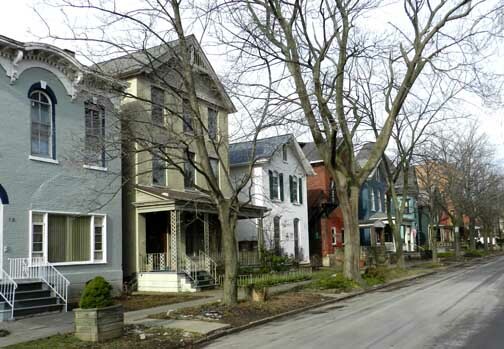 North Pearl is a lovely shaded street with homes built for Buffalo's post-Civil War upwardly mobile population. 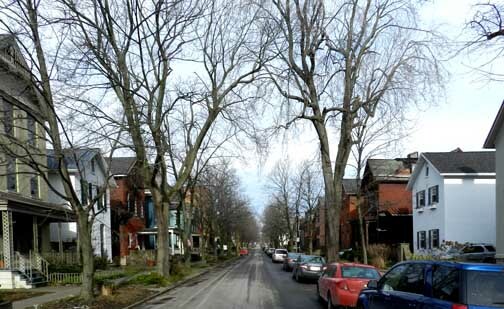 With some exceptions in the 1950s, the street and homes have been conscientiously preserved. 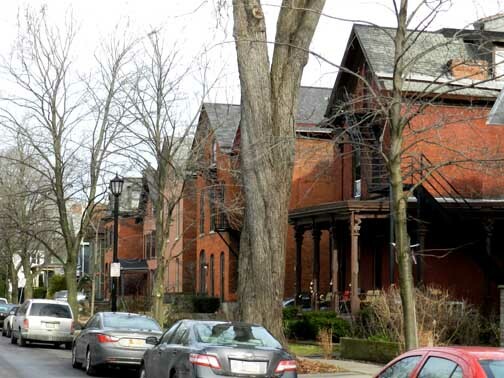 It is perhaps the best area in Buffalo for viewing a large number of intact moderate brick Italianates. Many of these homes have been used as rooming houses. North Pearl Street is, in many ways, the most conscientious example of a prosperous Victorian residential street left in Buffalo, despite the changes suffered by some of its homes during the 1950's infatuation with modernization... North Pearl Street homes were built for 19th century Buffalo's upwardly mobile population and the structures reflect their builders post-Civil War prosperity. They are conservative mirrors of period styles, but built in brick and stone rather than in wood. Most importantly, these well-to-do young settlers could afford ornament and nearly every house on the street wears elegant and often unusual jewelry.